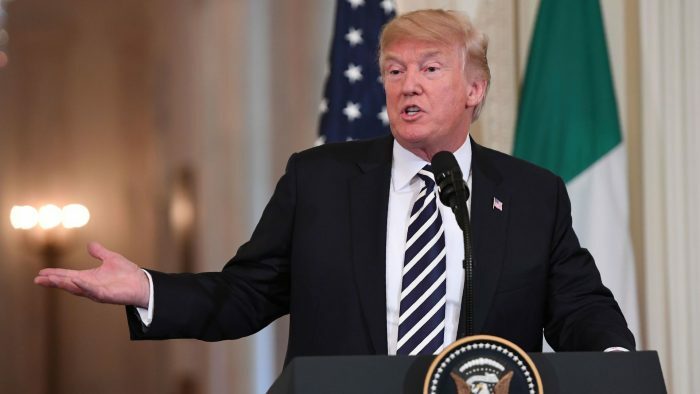 President Donald Trump’s nearly off-hand comment about being open to a meeting with Iranian regime leader Hassan Rouhani “anytime” puts the Iranian regime and their Iran lobby supporters between a rock and a hard place. On the one hand, if they simply denounce the invitation, they reaffirm the belief that the regime was never really interested in meaningful dialogue on topics not to their liking such as improving human rights, support for terrorism or interfering in neighboring countries. It also calls out the Iran lobby’s persistent braying for diplomatic openings between the U.S. and Iran and once the president presents such an opportunity, critics such as the National Iranian American Council are quick to denounce it. It seems the Iran lobby can’t have their cake and eat it too under this president. If on the other hand, the mullahs accept the president’s offer, they might very run into a Trump version of what they have consistently done to others for decades which makes a show of diplomacy but grant nothing of substance and continue to apply pressure. The prospect of the mullahs getting a dose of their own medicine is ironic and somewhat refreshing. The varied responses from the regime are proof the mullahs in Tehran seem pretty confused as to what to do since it’s clear that President Trump’s offer is not really without preconditions. Rather, looming over Tehran is the precarious state of the economy, looming economic sanctions due to fall next week and mounting pressure internally from the Iranian people to change how the usual corrupt government operates. “Unfortunately, right now there is no low-hanging fruit in U.S.-Iran relations or potential negotiations. And the primary reason is that Trump, by violating the Iran nuclear deal and withdrawing from it, he really eviscerated the Iranian trust in the United States,” said Sina Toossi, a research associate at the National Iranian American Council. “He could potentially give that confidence to international banks and businesses, remove U.S. sanctions and allow Iran to get the benefits from the deal, and that could be used as a stepping stone for broader negotiations,” he added. Therein lies the crux of the Iran lobby’s problem. It has in Trump a U.S. president who doesn’t care about appearances or how critics view him and is just as intent on forcing regime change as any president in the last 30 years. While the Iran lobby is pushing to recover the gains lost from the failed nuclear deal, it recognizes the awful truth of their position which is that there are no meaningful gambits left it can use on this president. The Iran lobby and the regime have sought a bailout from Europe by trying to persuade the European Union to stay in the nuclear agreement. Rouhani met with the new British Ambassador to Tehran Tuesday where he announced, not for the first time, the US withdrawal from the multilateral nuclear deal in May was “illegal,” adding that “the ball is in Europe’s court,” according to CNN. But that prospect seems as likely as snow falling right now on a California beach as the president is already pressing the EU over the issue of bilateral trade tariffs that has Europe busy focusing on its own trade deals. The poor mullahs are not at the top of the to-do list for Europe anymore and the trade they represent is a pittance compared to the whopping $690 billion in trade between the EU and U.S.
Nic Robertson at CNN offered his own analysis that the Iran regime may take a long view in responding to President Trump. He posits that Iran is willing to use a subtle approach in trying to divide the U.S. from its allies and by not ramping up extremist acts with its terrorist proxies such as Hezbollah is a sign of this approach. He also offers that summits with Russian president Vladimir Putin and North Korea’s Kim Jong-Un are different since Iran’s leaders are not in as precarious a position. With apologies to Robertson, that is a bad misread of the regime. The mullahs are under intense pressure not only from a rial about to be less valuable than the paper its printed on to massive protests rocking the country since last year that have not abated and have taken on a dire tone with protests aimed directly at the regime’s top leaders. The basket case economy is so bad, that Iranian parliament members have demanded Rouhani appear before them in one month to answer questions about the economy. It is the first time parliament has summoned Rouhani, who is under pressure from rivals to change his cabinet following a deterioration in relations with the United States and Iran’s growing economic difficulties. On Tuesday, hundreds of people rallied in cities across the country, including Isfahan, Karaj, Shiraz and Ahvaz, in protest against high inflation caused in part by the weak rial, according to Reuters. The mullahs are now faced with change or doubling down on crazy and potentially pushing the Iranian people too far or accept the truth that the regime’s days are numbered.